2013 American Silver Eagle bullion coins notched an all-time monthly record Tuesday, Jan. 29, 2013, after returning from a more than one-week sales suspension. January sales of the 99.9% pure silver bullion coins now total 7.42 million, according to United States Mint data. That handily breaks the previous monthly sales record of 6.422 million from January 2011. The total should continue to advance in the next two days, though not to the potential possible. 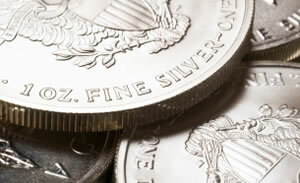 The U.S. Mint implemented an allocation process to limit dealer orders and maintain Silver Eagle supplies. This year’s 2013 American Silver Eagle bullion coins launched on Jan. 7, 2013 and scored an opening-day sales record of 3.937 million. The robust start happened after the U.S. Mint’s inventory of 2012 American Silver Eagle coins sold out three weeks earlier. In play was the resulting window of bottled up demand paired with always exceptional interest in a year’s newly dated coins. After the start, sales continued higher through to 6.007 million bullion coins. They ended there temporarily on Jan. 17, 2013 when the U.S. Mint’s inventory of Silver Eagles sold out and it implemented the sales suspension. Heightened demand is just as clear across other American bullion coins. Also on Tuesday, January sales of 22-karat American Gold Eagles reached 140,000 ounces for the highest monthly total since July 2010’s tally of 152,000 ounces. And for the day as well, 24-karat American Gold Buffalo bullion coins hit sales of 72,000 ounces for the most in a month since 116,500 ounces moved in October 2009. American Silver Eagle bullion coins have been produced since 1986. The annual sales record of 39,868,500 coins happened in 2011. That averages to more than 3.3 million a month. As reported last week, the United States Mint is not the only world mint experiencing higher-than-normal bullion demand. The Royal Canadian Mint is currently limiting orders of 2013 Silver Maple bullion coins to make sure they can continue to take sales orders from distributors. Just think if the Mint had had the foresight to stock enough silver blanks to meet demand. Oh, I forgot. They used to be mandated by law to mint silver eagles ‘to meet demand’ until the wording changed, giving the Feds the discretion to determine what they THINK demand is.